And the pilots' union BALPA (British Airline Pilots' Association) has written to new Secretary of State for Transport Philip Hammond and new Business Secretary Vince Cable asking them to intervene. Said Jim McAuslan, BALPA General Secretary: 'The last three days have changed the face of British politics with erstwhile political opponents coming together for the common good. We call on Government to use that political momentum to help solve what are tired 1970s style industrial relations. 'Without some of that Cameron/Clegg magic this dispute will put the future of a great airline at risk and disrupt the lives of thousands of British families. 'BALPA's British Airways Company Council is gravely concerned about the consequences of BASSA's decision to announce a damaging series of four five-day strikes commencing Tuesday 18th May 2010. BA faces circumstances that pose a very serious threat to its future - the economic downturn associated with the credit crunch, sustained high fuel prices, an increase in competition in key markets, and volcanic ash causing airspace closures, to name but a few. 'BA pilots and other staff groups, that include members of Unite, have made significant concessions to help BA through such difficulties and it is for all groups within BA to deliver the contribution required in the Company Business Plan. 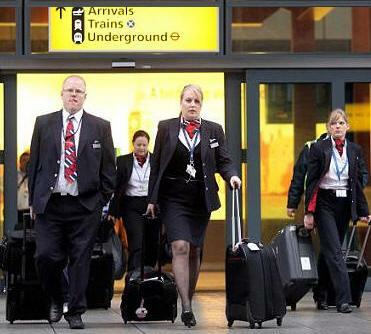 Recent industrial action by cabin crew has further damaged BA's finances and the unprecedented strikes just announced for May and June will seriously threaten BA's ability to maintain the job security and terms and conditions of employees in all parts of the Company, including cabin crew. 'The action also undermines the interests of all employees who are members of BA's final salary pension schemes, both of which are in deficit, and reaching a critical point in their triennial valuations. The BA Company Council, therefore, urges BASSA and BA to immediately enter meaningful negotiations to resolve their remaining differences and commence the process of rebuilding industrial relations upon which the Company's and employees' future prosperity are dependent.